Celebrating the diverse cultures, religions, and histories of South Asia. The South Asian Studies Association (SASA) is an alliance of scholars, academicians, and business leaders dedicated to fostering greater understanding of the region’s global importance. This is accomplished via study of its history, cultures, religions, philosophies, governance, politics, economics, art, literature, and more. SASA members and collaborators focus on South Asia’s rich and diverse past, its bold and remarkable present, and its soaring prospects for the future. SASA 2019 will again address and celebrate South Asia’s place in the world and leading scholars and academicians will again gather and present papers and talks within traditional academic tracks. SASA 2019 will also present its three innovative Plenary Sessions, this year focused on Higher Education globally, on the Social Media revolution across South Asia, and on Health & Wellness: Planet Mind and Body. 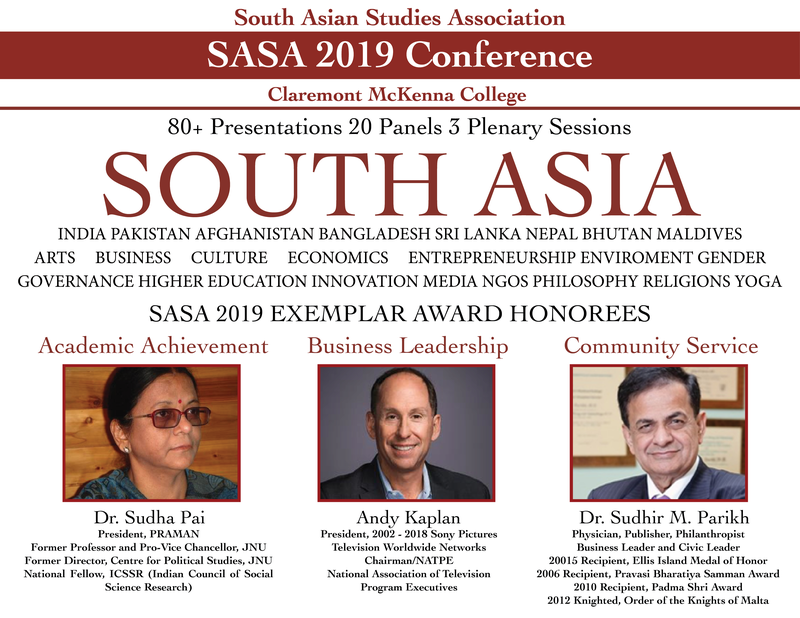 For South Asianists and those interested in the region, SASA 2019 will be another not-to-be-missed event.